Eloping used to be a method to marry quickly, usually in secret, but nowadays it means something entirely different. Elopements, or intimate weddings, are becoming a fast-growing trend as more and more couples choose to say their vows in a quiet ceremony, a far cry from the elaborate and opulent wedding extravaganzas that take place each year. But eloping doesn’t mean you need to compromise on your wedding vision - it can be a special day for the two of you, or for you and your closest friends and families, and can be done without losing any of the magic of a larger wedding. A private ceremony gives you the freedom to choose what matters most. If you want to be surrounded by your loved ones in a quiet, romantic celebration at an intimate wedding venue, then make that vision a reality. Couples are realising that they have the freedom to choose the kind of wedding that they truly want as it becomes more socially acceptable to announce that your wedding will be a private affair. Corrina Walker Photography. Design by Rocky Mountain Bride. Being more cost effective is certainly a reason to think about an elopement package, but being more cost efficient might be a better way to approach your wedding. Imagine the impact of five tables with elaborate arrangements as opposed to 20 with the same budget. The average cost for a wedding in Canada in 2018 was $31,000; applying your ideal budget to a smaller ceremony will vastly impact the look and feel of your wedding. Perhaps you have your eye on a specific dress that isn’t in your budget with a large wedding – but with a smaller wedding you can allocate more funds to getting the attire you truly desire. A private wedding allows you to prioritize your spending on the areas that matter most, rather than going toward a food budget for guests you feel you should invite but haven’t seen in years. It also relieves the pressure of having to invite those people who aren’t in your inner circle. When you explain that you’ve eloped, people are less likely to be offended about not receiving an invitation. When you choose to elope, your day will feel more intimate. If it’s just you and your partner, you’ll be spending the day with the one person with whom you want to be. Alternatively you can plan an elopement with only your closest friends in attendance, giving you plenty of opportunities to have meaningful interactions with them all day without being pulled in multiple directions at once. Choosing an intimate wedding venue means your day can truly be yours; no compromises, just as two of you envision. Planning for your wedding can be more relaxing as well. There is far less pressure to choose a date that suits the majority of your family; instead you can just pick the date that works best for you. You could even choose to forego décor entirely and end the evening in a restaurant. 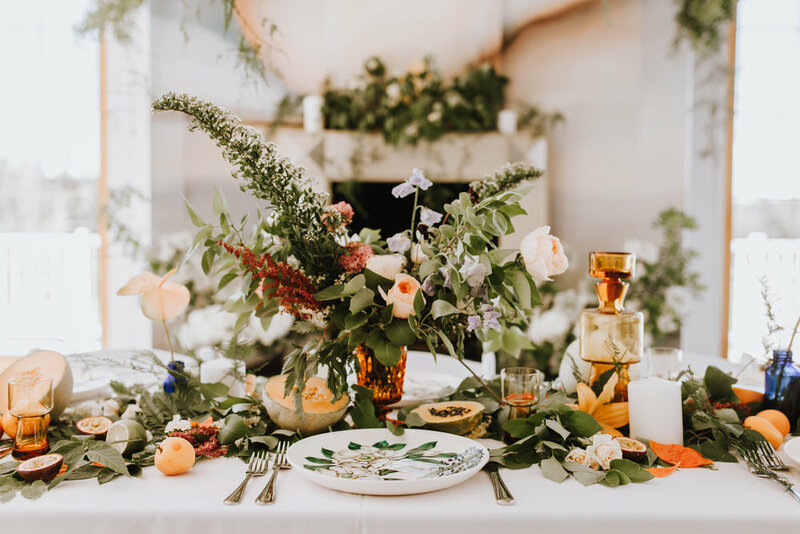 One particular couple at Cherry Creek Estate who chose our Rocky Mountain elopement package had a multi-course dinner served to just the two of them in our 13,000 square foot mansion! When you elope, options open up to you for less conventional wedding venues. You could pick a museum, a public garden or an art gallery as an intimate wedding venue. Many places now offer elopement packages so venue options are wide open, especially if you are flexible on which day of the week you get married. There’s fewer scheduling rules to follow as well, allowing your day to unfold as you wish. One way to elope while still including your family in your happy occasion is to have a reception when you return to celebrate. You will come back refreshed from the minimal planning and blissful alone time, ready to celebrate with your loved ones. Some couples choose to incorporate elements of a wedding into the reception held after an elopement to help family members feel more included. Ideas include having a unity ceremony, cutting a wedding cake or presenting a slideshow of your intimate ceremony. Eloping can be an idea that naturally develops with a couple if they’re getting married later in life. A bride in her 20’s is more inclined to have a wedding with 200 guests in an elaborate gown, surrounded by everyone she knows. As more couples get married in their 30’s, however, their priorities shift and instead of a large celebration they want to have an intimate ceremony. Eloping can sometimes become a glorified honeymoon, especially if you incorporate traveling to your location with your private wedding. So how do you decide if an elopement or private wedding is right for you? If the idea of throwing a lavish party with all of your family and friends in attendance fills you with joy, then a traditional wedding is right for you. If your heart is set on an intimate affair with a limited guest list of only your nearest and dearest to help celebrate, then consider eloping. Cherry Creek provides options for Rocky Mountain elopement packages throughout the year. If an intimate wedding venue in BC is something you’ve been considering, please feel free to contact us and ask about our small and intimate wedding package.